The North American Process Technology Alliance (NAPTA), funded in part by the National Science Foundation, has accepted Calhoun Community College into its Mentoring Program to help establish a Process Technology Degree Program (AAS). Interest surfaced when workforce development initiatives brought local industry and education representatives together to look at critical skills for the workforce of tomorrow. See Curriculum Card for Courses Needed for Degree Completion (Hours). 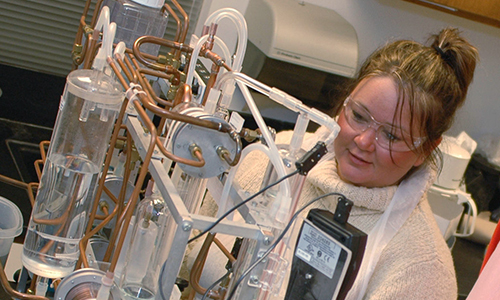 The Process Technology program prepares individuals to monitor, operate, and maintain equipment used in the processing of raw material into marketable chemical/petrochemical products. This includes instruction in materials handling, extraction, distillation, evaporation, drying, absorption, heat transfer, instrumentation and reaction processes. It also includes chemical and fire safety, codes and standards, and general plant operations. The program emphasizes safe and efficient work practices, basic occupational skills and employ-ability skills. The content is organized into competency-based courses of instruction which specify occupational competencies which the student must successfully complete. There is a high demand for process technicians. Alabama ranks fourth in the nation for the highest concentration of chemical plants and system operators with an average salary of $67,930 with the 90th percentile in the $90,000 range not including overtime or benefits, which also comes in at fourth in the nation. Career opportunities in our area include: 3M, Daikin, Indorama, Bungee, Hexcel, Toray, Ascend, OCI, BASF, GE, and Decatur Utilities. Job Opportunities for graduates: Process Technician, Chemical Operator, Systems Operator, Gas Plant Operator, Water and Wastewater Treatment Plant System Operator, Refinery Operator, Production Technician and a variety of other process related jobs.